YANGON—Even as Laos’s planned railway connecting southern China with northeast Thailand comes under scrutiny due to its huge cost and uncertain benefits, Naypyitaw has agreed to conduct a feasibility study on a high-speed railway project that would link two economic centers in Myanmar as part of Beijing’s grand infrastructure plan for the region. Critics of the rail project warn that it could saddle Myanmar with unsustainable debts, and point out that the route passes through conflict zones. By approving the feasibility study despite these concerns, the government has again signaled its willingness to cooperate with China in its bid for economic supremacy in the region. Two state-owned companies, China Railway Eryuan Engineering Group (China Railway Group Ltd) and Myanmar Railways signed a memorandum of understanding (MoU) last week to begin studying a proposed railway line from Muse, in northern Shan State, to Mandalay. The rail link would form part of the China-Myanmar Economic Corridor (CMEC), which is itself a part of China’s ambitious Belt and Road Initiative (BRI), President Xi Jinping’s signature foreign policy unveiled in 2013. The BRI would create a trade network of more than 70 countries in Asia, Africa and Europe. Muse and Mandalay are envisioned as key hubs in a plan to improve connectivity in Southeast Asia, so the proposed railway is viewed as economically and strategically important for both sides. Muse sits on Myanmar’s border with Yunnan province in southwestern China, and is the largest trade portal between the two nations, while Mandalay is central Myanmar’s commercial center and the country’s second largest city, so the railway could become a lifeline for China-Myanmar trade. Another component of the BRI announced by Beijing is the Bangladesh-China-India-Myanmar Economic Corridor (BCIM-EC). Encompassing the CMEC—which the two countries formally committed themselves to developing in an MoU signed in September—this route from Kunming, China to Kolkata, India would follow the ancient Southern Silk Road trading route through Myanmar and Bangladesh. Beijing plans to build a parallel expressway and railway from Ruili to Kyaukphyu with a separate road running through northern Myanmar, the northeast states of India and Bangladesh. The 1,700km CMEC runs from Kunming to Mandalay, then east to Yangon and west to the Kyaukphyu Special Economic Zone (SEZ) in western Rakhine State. China has already succeeded in renegotiating its stake in the SEZ, where it plans to build a deep seaport and which already serves as the terminus for twin cross-border oil and gas pipelines between the two countries. The proposed railway link is not the first between the two countries. In 2011, Beijing and Naypyitaw signed an MoU to build a railway between Muse and Kyaukphyu. According to Chinese media reports, China Railway Group was to be in charge of building the rail line from Ruili in southwestern Yunnan Province to Kyaukphyu via Muse. The entire rail line was to run 810km. Under the terms of the MoU, the project was to have been completed at a total estimated cost of $20 billion in less than three years. However, the government of then-President U Thein Sein suspended the project following strong local objections. In 2014, the agreement expired and the railway project remains in limbo. China has since completed a stretch of line from Kunming, the capital of Yunnan Province, to Ruili, to be connect with Myanmar in the future. 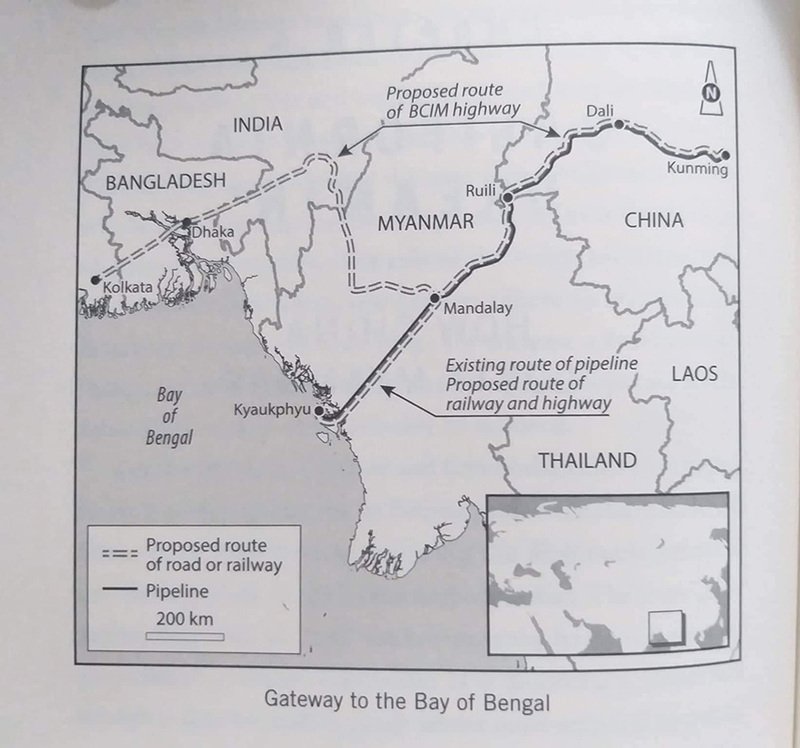 China later approached the government led by State Counselor Daw Aung San Suu Kyi, asking it to consider building a railway from Muse to Mandalay as the initial part of China’s strategic railway link from Ruili to Kyaukphyu. China Railway Group proposed the feasibility study for the line from Muse to Mandalay in May 2017, according to the Myanmar Transport Ministry. To assist the study, the ministry asked for recommendations from the Shan and Mandalay chief ministers, and related ministers. In June, both sides worked on the MoU draft. On Oct. 2, a government economic committee gave the Ministry of Transportation and Communications the green light to sign the MoU. Under the agreement, China Railway Eryuan Engineering Group will cover the full cost of the study, which will assess the environmental and social impacts of the proposed railway line. While the agreement calls for a study period of two years, Union Minister of Transport and Communications U Thant Zin Maung said Myanmar expects to finish it within one year. Though the MoU only commits the two sides to begin a feasibility study, the minister said the railway is a priority project and part of Myanmar’s national transport master plan. The minister said Myanmar is in the process of implementing five priority transportation corridors. 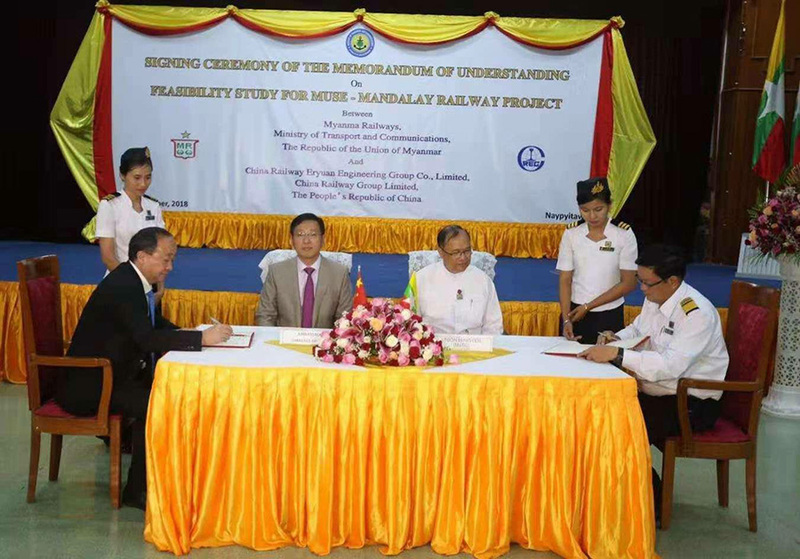 The Muse-Mandalay railway would be part of the South Transportation Corridor section of the Trans Asian Railway Network (TAR), a project implemented by the United Nations Economic and Social Commission for Asia and the Pacific. Myanmar and China expect to link with the eastern states of India via this route. The Mandalay-Muse railway project will be 431km (268 miles) long, with trains running at speeds of 160 km per hour, the ministry said. The journey from Mandalay to Muse would take roughly three hours. Currently, Mandalay is connected to Muse via Lashio by the national highway. The drive normally takes more than eight hours. There is an existing 313 km meter-gauge railway from Mandalay to Lashio. Since 2017, as a key project of the China-Myanmar railway, a standard gauge line has been under construction from Ruili, in western Yunnan Province, across the border from Muse and around 140 km from Lashio, according to the New China TV. New China TV reported in August 2017 that Chinese engineers are drilling one of the world’s longest rail tunnels—the 34.5-km Gaoligong Mountain Tunnel in southwest China’s Yunnan province. It will be part of a railway that will eventually connect China and Myanmar. According to the ministry statement, the proposed route will connect the Ruili East Railway and run to Muse, Lashio, Kyaukme, Pyin Oo Lwin and end in Mandalay. Chinese Ambassador Hong Liang said the project would support the BRI and CMEC while promoting peace and stability in northern Myanmar. In June, U Thaung Tun, the Union government minister and national security adviser, told the South China Morning Post that a railway project linking Ruili and Mandalay “would start quite soon”. He said it had potential to extend to Yangon and Kyaukphyu. Although both sides have voiced confidence in the project, regional experts warned that it will face many challenges, particularly the armed conflicts in project areas and resistance from local people who have negative sentiment toward China based on past impressions of the country’s investment in the country. “It could easily provoke more fighting in those areas, not necessarily because of the construction of the railway itself but because troops will be brought in to provide security for the project, so it is almost inevitable that there will be fighting when the Myanmar Army engages ‘clearance operations’ along the railway route,” longtime Myanmar observer Bertil Lintner told The Irrawaddy. “And who will the workers be? Will China, as usual, bring in their own labor, or employ local people? If they bring in Chinese labor, there is bound to be resentment among local people along the railway route,” he said. It is also likely that land will be confiscated to make way for the railway, and people are not going to like that, he added. Experts point to broad pushback against China’s BRI projects from Malaysia and Sri Lanka to Zambia. The NLD-led government should bear this global pushback against China in mind and use it as leverage when dealing with China, they say. Some of the BRI projects have been slow to get off the ground, while others have been criticized for creating unsustainable debts for the host countries. According to a March 2018 report by the Washington-based Center for Global Development, China is putting many countries involved in the BRI at financial risk through a series of “aid” activities and huge amounts of lending. Amid increased pressure on Myanmar from the West due to the Rohingya crisis in Rakhine State, the government has grown more agreeable to involvement in the BRI. “The Rohingya crisis, and the West’s condemnation of what has happened in Rakhine State, have pushed Myanmar back into the hands of the Chinese, and the Chinese are taking full advantage of the situation to advance [their] own interests,” Lintner said. In recent months, Naypyitaw has signed an MoU committing itself to the USD2-billion CMEC, but key questions remain over ownership, operation, project terms and financing, and whether Myanmar can afford the BRI infrastructure projects. The head of the US Overseas Private Investment Corporation has warned that the BRI was creating a debt trap for many poor nations.